Friday 9 November 2018: Habitat has unveiled its new stand-alone flagship store today in Brighton city-centre as part of the 1.3 acre Hannington Estate redevelopment. Located on North Street and leading into Meeting House Lane, the new 6,500sq ft store, now Habitat’s third-largest store in the UK, has been designed by Habitat’s own in-house Design Studio and features over 3,000 products from the Habitat collection across, furniture, lighting, textiles and home accessories. Designed by the Habitat Design Studio the new store is housed across ground and basement floors with a pared back, industrial vibe. Metallic piping is left exposed along with raw concrete surfaces and exposed brick walls painted white to create a pure interior framework. Customers are first greeted by a central cobalt blue metal stairwell, a glass wrap-around balustrade allowing you to see directly down into the larger basement level from street level. A dramatic lighting installation hangs above this staircase which will be change regularly with new lighting designs. Oak flooring runs throughout the store but to the right of the store entrance, a checkerboard tile floor outlines an installation space area within the windows that will house special collections, workshops and events. The ground floor is mainly allocated to dining, tableware, upholstery and home accessories. Downstairs, a glass ‘goldfish bowl’ halfway down the stairs allows an uninterrupted view into the basement below which features bedroom furniture, office, and textiles. Black and white checkerboard flooring is also used towards the back of the store within a bright lighting department to visually attract attention and draw customers further into the basement space. 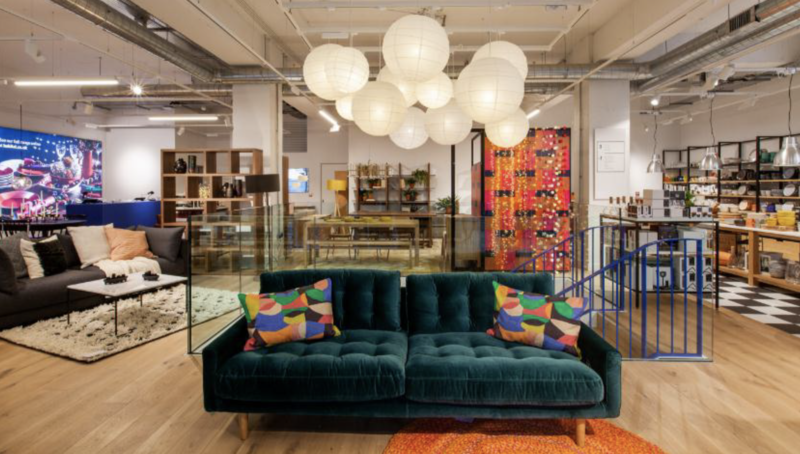 17 Habitat store colleagues will work within the store, on-hand to explain product features and highlight additional product options from Habitat’s 4,500 product collection online that can be ordered for home delivery or Click & Collect from over 2,000 locations in the UK. Habitat has also unveiled a collaborative project partnering with local artists from the area. Working with Sophie Abbott, Becky Blair and Lauri Hopkins, artwork has been translated into a limited-edition series of rugs that will retail at the new store. Habitat plans to continue this project each year, asking local artists to submit artwork to be turned into products that will feature in the Habitat collection.